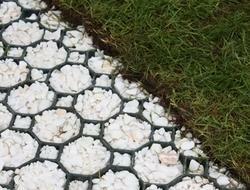 Manufacturer & Supplier of Grass Pavers. Our product range also comprises of Railing Planter, FRP Planters and Stainless Steel Planters. Owing to our highly-advanced infrastructure unit and immense knowledge, we are engaged in offering a sophisticated range of Grass Pavers. It is thoroughly examined by our skilled team of professionals to ensure its unbeatable quality. It is manufactured with fine quality of raw material and high-end technology, which conforms to predefined guidelines of quality. This paver is exclusively designed to render maximum space to grass cover as well as supporting vehicle movement. Our clients can avail it at industry leading prices.